Midseason report card: How does the Mariners’ surprise success grade out? Wed., July 18, 2018, 6:06 p.m.
SEATTLE – Here’s a quick look at the Mariners report card from the first half of the 2018 season determined by a writer that never checked his grade point average in college. This was supposed to be the strength of the team coming into the season. The lineup had power, speed, depth, athleticism and experience, giving the Mariners multiple ways to score runs compared to the two previous seasons where the team totally relied on Robinson Cano, Nelson Cruz and Kyle Seager to produce all of the offense. But that projected lineup has rarely been on the field together because of injuries and the 80-game suspension of Cano. Mike Zunino missed the first 17 games of the season because of a strained oblique – an injury that completely derailed all of the progress made this spring. Ben Gamel missed the first 15 games also with an oblique strain. Nelson Cruz missed nine games after injuring himself in a dugout fall and also missed a couple of games with elbow issues. Dee Gordon missed nine games on the disabled list with a fractured toe, while Ryon Healy missed 17 games with a sprained ankle. In fact that projected everyday lineup, including the platoon of Gamel and Guillermo Heredia, played in a total of nine games this season. The Mariners are currently averaging 4.25 runs per game, which ranks 10th of 15 teams in the American League and below the league average of 4.44 runs per game. They are third in team batting average (.258) with an on-base percentage of .319 (league average .317) and a .414 slugging percentage (league average .413). While it seems like they strike out a lot, that’s just the current trend in baseball. The Mariners’ 751 strikeouts are below the league average of 807. Regardless of what some folks may think, they miss Robinson Cano’s bat in the lineup. Before he was injured and then suspended, the team had a slash line of .261/.329/.434 while averaging 4.69 runs per game. In the 58 games since, Seattle has a .256/.312/.402 slash line and is averaging 3.94 runs per game. The absence grows more glaring given injuries and slow periods to other players. His bat is needed. The defensive metrics, which aren’t without their flaws and limitations, haven’t been kind to the Mariners in the first half of the season. Seattle rates below average in Baseball Information Solution’s defensive runs saved above average (10th at -16), Fangraphs’ Defensive WAR (10th at 1.1) and Ultimate Zone Rating (11th at -2.90). The metrics were also rough on the Mariners’ outfield, particularly when Dee Gordon was playing in center field. But to be fair, Gordon wasn’t expected to be a Gold Glove performer right away. But even if the metrics don’t have Gamel, Heredia and Mitch Haniger listed as high-level outfielders, they’re a significant upgrade over past seasons where the Mariners eschewed defense like a slowpitch softball team. Heredia’s presence in center has been an upgrade. Manager Scott Servais, he still thinks they’ve better defensively than the past two seasons. Seager has been brilliant at third base. He’s having a Gold Glove caliber year. Segura has also made vast improvement at shortstop after moving back to the position full time last season. Also Zunino, who is expected to return from the disabled list this weekend, has been outstanding in terms of throwing runners out and framing pitches. This wasn’t considered to be a strength going into the season. The clamor for the Mariners’ need to add another starting pitcher before spring training was loud, including from this writer. But James Paxton basically stayed healthy the entire first half. Mike Leake pitched to his expectation level. 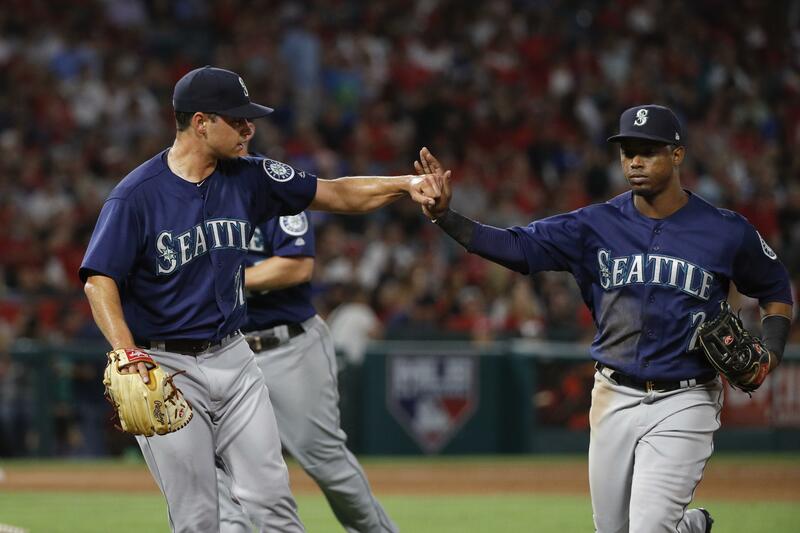 Wade LeBlanc proved to be a valuable late-spring acquisition, and Marco Gonzales has quieted many of the doubters and complainers about the trade that brought him to Seattle. The Mariners’ starting rotation has posted a 7.0 in Fangraphs WAR, which is fifth best in the A.L. By comparison, the Astros’ loaded rotation has posted a ludicrous 14.1 WAR. Seattle ranks 7th in ERA (4.09), fourth in quality starts (45), third in average innings pitched by a starter (5.8). These numbers have been accumulated despite Felix Hernandez having just a so-so season before going on the disabled list with a lower back issues. Hernandez is 8-7 with a 5.13 ERA on the season. He’s probably been their least productive starter. But to Servais, the importance is the quantity of starts. Paxton (20), Leake (20), Gonzales (19), Felix Hernandez (19) and LeBlanc (14) have been basically healthy most of the season. A year ago, the Mariners were dipping into their first three starters at Class AAA Tacoma to start games. That hasn’t happened this year. Seattle had just three other pitchers make a combined five starts. The disabled list stints for Paxton and Hernandez before the break were a matter of the schedule and added rest more than the injury. This unit was supposed to be a strength for the Mariners coming into the season and the overall group has been solid. The brilliance of Edwin Diaz, the strong showing from James Pazos and the unexpected contributions of Chasen Bradford have helped overcome the injury to David Phelps, the inconsistencies of Juan Nicasio and the failures of Marc Rzepczynski. Diaz leads all of MLB with 36 saves the All-Star break, which are a Mariners’ club record and two shy of the MLB record held by Francisco Rodriguez. What’s more impressive is that the Mariners have never lost a game when Diaz entered in a save situation. Sure, he’s blown a few saves – three to be exact – but Seattle is 44-0 when Diaz enters the game with a lead this season. Of those 44 wins, 20 have been one-run games. Prior to his hiccup in Colorado just before the break, Pazos had posted a 1.23 ERA in his previous 34 outings, while striking out 23 batters and walking just four in 29 1/3 innings pitched. To offset Nicasio’s early struggles with his command and injuries to Dan Altavilla and Nick Vincent, the Mariners acquired Rays closer Alex Colome to serve as their eighth inning set-up man. With Vincent healthy and Bradford becoming a trusted middle innings reliever, they have some depth. But don’t be surprised if general manager Jerry Dipoto adds at least one arm to this group. Published: July 18, 2018, 6:06 p.m.